First of all, let’s see why dealing with Salesforce can be a good idea. At the moment, Salesforce takes the place of one of the most popular CRM platforms in the market of enterprise software. The company was ranked first by Fortune in its 100 Best Companies to Work For in 2018. Also, according to the latest statistics, Salesforce’s CRM market share is 19,4%, and it has 150,000 customers. Among the categories of provided services, you can find commerce cloud, sales cloud, service cloud, data cloud, marketing cloud, community cloud, analytics cloud, app cloud, and IoT. The company offers almost every kind of enterprise software that you can think of. A wide range of software solutions can satisfy the most demanding customers. Moreover, any third-party developer that have enough skills can create and deliver a Salesforce component or provide modernization services for the existing components. Such an approach allows maintaining a wide diversity of available solutions and attracts developers for profitable collaboration. AppExchange is the Salesforce store where you can find all software solutions available at the moment. 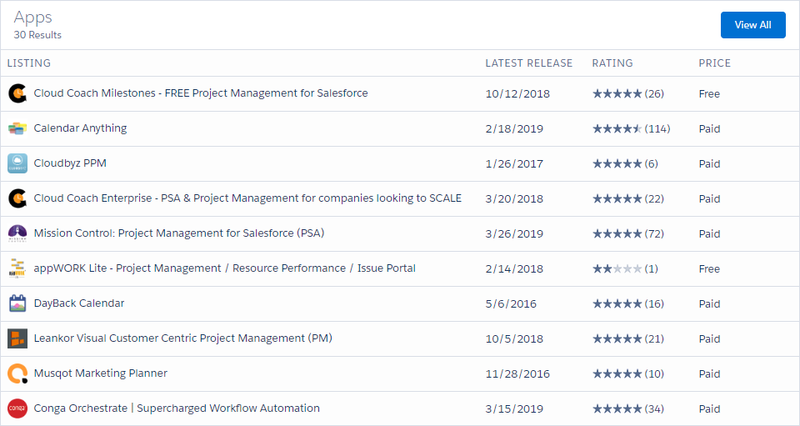 We’ll return to it later, but for now, you can use it to ensure that Salesforce apps can meet the needs of any business organization. Why Use dhtmlxGantt as a Development Tool? High-performance applications created with dhtmlxGantt allow processing an incredibly large number of tasks simultaneously. This feature will be in high demand among companies that work on complex projects. dhtmlxGantt can render 10,000+ tasks, and the app will work flawlessly and without any lags. It doesn’t matter whether you work with 10, 100, or 1000 tasks at the same time. In any case, you will still work with a stable running application. It’s hard to imagine a Gantt chart application that gained significant popularity among users without being able to do anything except rendering Gantt charts on the screen. Therefore, some additional functionality will never be redundant. The good news is that there are about 20 ready-to-use extensions that will allow you to meet the requirements of fairly diverse users. Tooltips, full-screen mode, status line, auto scheduling, smart rendering, and custom content — all these and many other features provide plenty of opportunities to achieve the desired look and feel. Extensive customization features is another advantage of dhtmlxGantt. By default, dhtmlxGantt provides seven skins, including Material-based one. Also, there is a range of predefined templates. It’s up to you how your Gantt chart application will look like. You can change any element of a user interface, such as tasks, links, or tooltips. Also, you can modify the existing templates of the grid, timeline, lightbox, and other elements. Do DHTMLX Gantt Chart and Salesforce Suit Each Other? Among them, there are 20 paid solutions. As you can see, this is an example of not the most competitive environment. For example, there are almost 600 schedulers, and more than 300 calendars available at the moment. Therefore, if you have an idea of a Gantt chart application that implements unique functionality, it’s more likely that your solution will be noticed. As a developer, you won’t face significant third-party libraries’ compatibility issues during the development of your Gantt chart app for Salesforce since dhtmlxGantt enables smooth and secure integration thanks to LockerService. The development toolkit that you’ll use provides extensive customization possibilities that will be very important when it’ll come to the creation of a unique enterprise application. Last but not least, you can receive support from an experienced team of DHTMLX developers with 10+ years of expertise in web and mobile app development. If you’re interested in implementing our Gantt chart library in your Salesforce app, don’t hesitate to contact us to get all the details and a live demo.